Posting this time we'll explain a bit long experience and our knowledge of seed production of oyster mushrooms. F0 main seeds are directly derived or taken directly from the fungal spores is often called a PDA. From one bottle can produce 40 F2 baglog white oyster mushrooms. If sorted, if we managed to make just one bottle of white oyster mushroom seeds PDA .., we can produce 30 bottles of F1 to F2 into 1500 bottles that can produce 60,000 baglog white oyster mushrooms . So indeed, do not be afraid to fail in making the PDA .., if the make 20 bottles PDAs nothing works .. just 1 only, then we can make a plant fungus that produces white oyster mushrooms baglog 60,000 .. remarkable not ...??????? Ok .. Now any kind that need to be prepared ...?? Potatoes are in good condition .. smooth, no spots are many, no foul stain .. just the best. It takes 200 grams only. Dextrosa of 20gram. Dextrosa can be purchased at pharmacies, or in the laboratory shop. The price in Malang around 50,000/ kg. For powder .. select the nodes. It takes just as much as 20 grams. Water 1 liter. Use sterile water, distilled water. Able to buy bottled mineral water is good quality. Sterile cotton and plastic lid sufficiently. Peel the potatoes well, then cut into a cube with a size of about 1cm3 kecil2. Weigh in order to get around 200 grams. Wash the potatoes until clean, then boil the potatoes with water was as much as 1 liter of water for approximately 20 minutes. Take water and strain the stew was as clean as possible enter into the measuring cup, and added with sterile water so that the amount of 1 liter of water be fit again. Mix in the liquid dextrosa had 20 grams and 20 grams for powder and mix evenly with the normal speed so it was really late with the good. PDA is a liquid mixture. Enter this PDA liquid in the bottle as high as 50-100 mm flat course then closed with sterile cotton and then cover with plastic and rubber to be really tight. Note: the selected bottle is flat like a used bottle of bottle of honey / or small-size bottles of whiskey. bottles previously cleaned and sterilized by boiling the bottles with boiling water for about 10 minutes. Indeed, in making seeds PDA, cleanliness, sterilization places, tools and materials is the main requirement in supporting its success. After that the next step is we mensteril PDA liquid in the bottle before using the autoclave for approximately 30min-45menit the temperature 120 degrees C. For those of us who perhaps most do not have an autoclave, using current could presto pressure pot. Old media sterilization in a pan presto is after the water boils in presto-pressure steam and produce sounds that marked the pan, keep this condition for about 60min until 45menit-sure was sterile conditions very well ..
After that, do not immediately opened, allow to cool to approximately 37 degrees C. Remove the bottles before and place it in a slanting position / sleep for liquid can be widened with the aim of increasing the area of ​​media. Note, just in putting this to bed, do not let the liquid reach the mouth of the bottle. 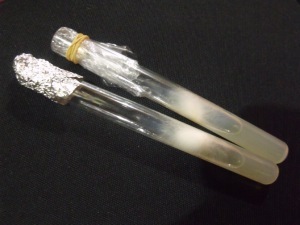 If the fluid had been hardened PDA for, then be ready for the Inokulasikan seedlings obtained from the fungus directly. Inoculation chamber form a closed and sterile place, we make it with a wooden box the size of 0.7 mx2mx0, 5m, it was glass. Conditions of plywood coated with white melamine for clean and sterile. Spray chamber inoculation with alcohol until sterile .. leave for more than 20 minutes. Enter all the tools into it. Prepare the mushrooms as well .. Select mushrooms are good, the condition of the young, not wet, has a single large trunk and hard. clean white condition. Chill algae and place it on the glass is clean and sterile. Take mushrooms (o it, before inoculation, spray your hands with alcohol with evenly until benar2 sterile too) Tear off the fungus in the direction of its length, the location of spores that much about near the handle but still in the hood. Using a needle / handle before, take small pieces of mushroom size of approximately 2-3mm2. Make sure picked the needle tip had already benar2 sterile and did not touch the outside of the needle. Once again because it's important! All processes must be close to the fire bunzen. If successful, it could be seen within 3-4 days as indicated by the spread of white mycelium on the surface for PDAs.